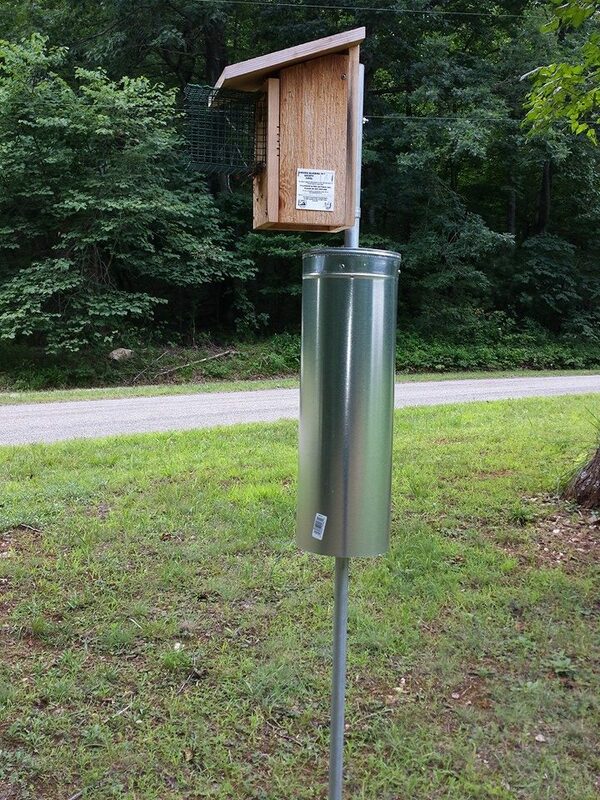 This represents my most efficient nestbox setup that fledges 4 species of native birds: Eastern Bluebirds, Carolina Chickadees, Tree Swallows, and House Wrens. I’m waiting for more nesters to add to the species list –ALL NATIVE BIRDS, of course. My nestbox setups today. 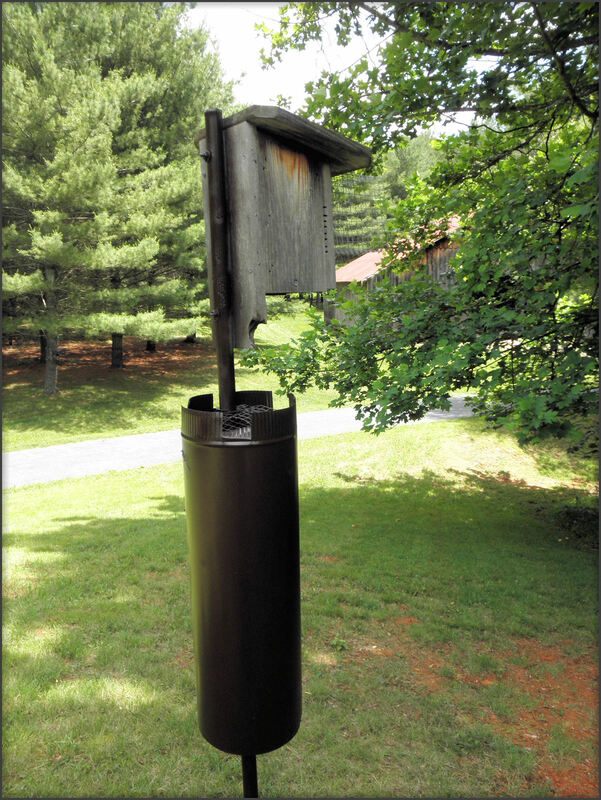 8″ wide wobblilng stovepipe baffle and the Noel Guard made from PVC coated hardware cloth. I have had many changes to the trail in past two years. I will be posting new photos of the different nestbox setups and habitats soon. I am experimenting with different things on my trail, so each setup will not always be exactly the same. Presently monitoring 34 nesting sites–keep accurate records and reporting them in to several important birding organizations. It started with just one nesting box! Here is a rundown for now of the styles, installation method, and locations in summary. Photos forthcoming prior to 2014 season. Bolded items reflect action needed for 2014 nesting season. Hope to complete this autumn before colder weather. You will note many PRIVATE PROPERTY listed; permissions granted by homeowners to install and monitor and access year-round these nesting boxes. #1: Private Property: Open Field-Pasture. #2: Private Property: Open Grassy Lawn High in Windier Location – Beautiful Mountain Views. #3: Private Property: Pasture, Creek Nearby, Some Taller Grasses in Area. #4: My House: Mowed Lawn on Pond’s Dam. #5: My House: Pasture across, Unpaved rural road, and Woods Nearby (want to move for 2014). #6: Private Property: Mowed Lawn near Road with Pasture Across..
#7: Private Property: Mowed Lawn and Untreated Mulch Beds (without herbicides). #8: Private Property: Open Field, Needs Mowing Periodically by Large Tractor due to Tall Grasses. #9: Private Property: Pasture Along Roadway. #10: Private Property: Needs to be moved–cannot monitor–at private residence. #11: My House: Mowed Lawn with fence line nearby. #12. Private Property: Mowed Lawn at Bed and Breakfast. Beautiful pines trees loved by the bluebirds. #13: Church Grounds: on Mowed Lawn on Fence Line. #14: Public Park: Overlook to Cemetery Nearby with Fence Line. #15: Public Park: . Mowed areas. Offset Not Too Visible to the Public. #16: Private Property: Mowed Lawn with Plenty of Spaces! Two-Holed Mansion–Conducted Three-Year Test Site. #17: Private Property: Mowed Lawn, Gardens, Untreated Mulch Beds. #18. Private Property: Hilly Mowed Lawn by Roadside. #19. Private Property: Mowed Lawn and Gardens. #20. Private Property: Mowed Lawn with Pasture Nearby. #21. Private Property: Mowed Lawn Near river. #22. Private Property: Mowed Lawn Near Two-Lane Highway. #23. Private Property: Mowed lawn, Pines Stand Nearby. #24. Private Property: Open Field In-Town Location; Needs Mowing by Large Tractor Due To Tall Grasses. #25. Private Property: Mowed Lawn on Historic Home Grounds-In-Town Location. #26. Private Property: Mowed Lawn Near Highway. #27. Private Property: Mowed Lawn-rolling hills. #28. Wide open mowed lawn, pasture nearby. #29. Mowed lawn on rural road with fence line. #30. Pasture and overlooking small cemetery. #31. Pasture and mowed lawn, wire fencing nearby. #33. Mowed lawn, rolling countryside. Typical and very effective nestbox with two predator guards. I painted the stovepipe a dark brown–looks nice. This is one of the original boxes built in the workshop in 2007 and was retrofitted from front opening to side opening to accommodate the hardware cloth Noel Guard. I just found your blog while searching for an adjustable pole for my bluebird box, though I didn’t find that on your blog. lol But I did find your blog really interesting and wondered if you have a plan here for your bluebird boxes. They look a little bigger than the typical plan I found online. I thought I sent a reply to your question on the plans I use for my nestboxes. Did you get it?